Can you believe it is almost August? July flew by so quickly for me and I hope everyone is having an amazing and productive week! 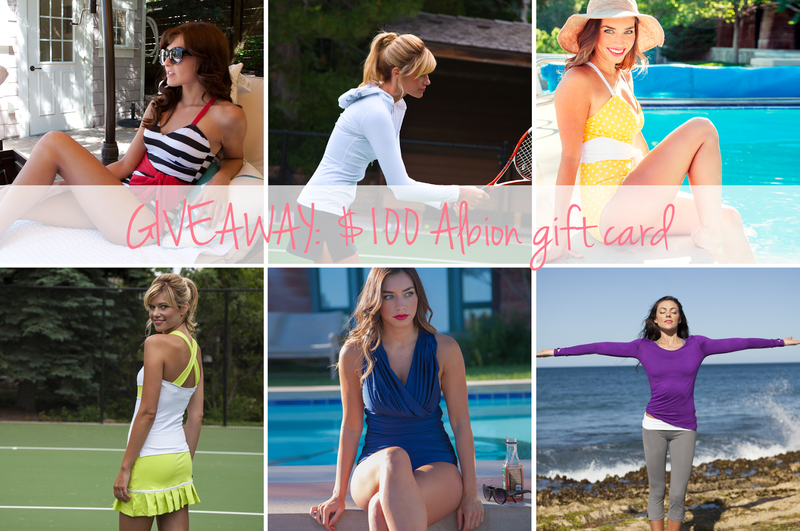 Also, don't forget to sign up for my $100 Albion Fit gift card giveaway! :) Good luck! Blazer: Leopard Print Jacket thanks to Karen Kane, here. 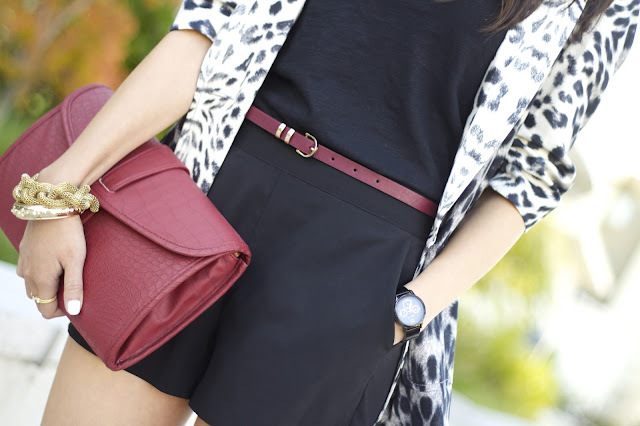 Steal: Printed Sateen Blazer Jacket from Target, here. Splurge: Leopard Print Jacket from Karen Kane, here. Shirt: V-Neck Tee from Forever 21, here. Steal: V-Neck Tee from Forever 21, here. Splurge: V-Neck T-Shirt American Eagle Outfitters, here. Belt: Patent Waist Belt from Forever 21, here. Steal: Patent Waist Belt from Forever 21, here. Splurge: Lauren Leather Belt from Nordstrom, here. Shorts: Silky High Waist Shorts from Nordstrom, here. Steal: High-Waisted Drawstring Shorts from Forever 21, here. Splurge: Silky High Waist Shorts from Nordstrom, here. Bracelets: Mesh Link Bracelet thanks to Love Stylize, here. Suzie bangle thanks to Sequin, here. Steal: Carole Chain Link Bracelet from Nordstrom, here. Geo Cutout Bracelet from Forever 21, here. Splurge: Mesh Link Bracelet form Love Stylize, here. Suzie bangle from Sequin, here. Steal: Twisted Midi Ring Set from Forever 21, here. Splurge: BP. 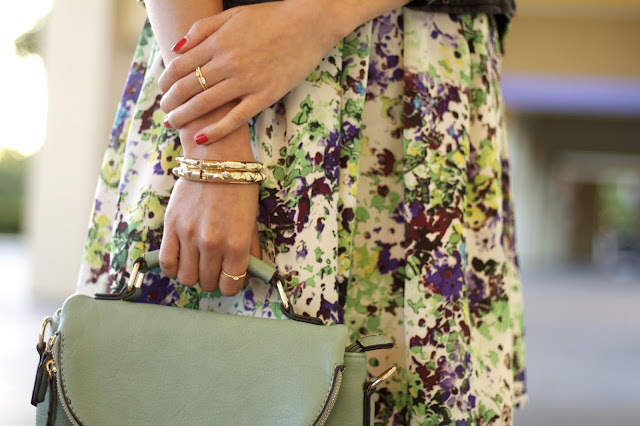 Stackable Rings from Nordstrom, here. Bag: Red Clutch from Hong Kong. Steal: Croc-Stamped Crossbody from Forever 21, here. Splurge: Studded Chain Link Clutch from DailyLook, here. Steal: 44 Pump Pumps & Heels from DSW, here. Splurge: Chinese Laundry Serendipity Heels from DailyLook, here. One of my favorite color combinations are gold and pink, or anything with pink. You may of noticed that I have many skirts in different shades of pink. 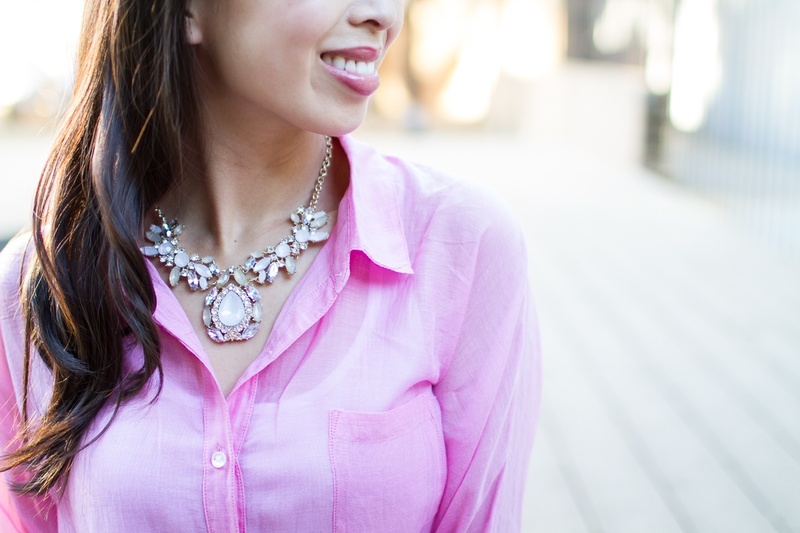 Pink is my favorite color and I love the feminine and playful vibe it emits. My other half and I try to make a point to celebrate our monthly anniversary, and I wore this over the weekend when we dined at Chez TJ, a yummy french restaurant in Mountain View. The most interesting and delicious dish we had was a tempura fried egg yoke with smoked salmon. The yoke is fried to perfection, was runny, and went so well with the smoked salmon. I really love the fullness of this skirt, the only downfall is that it might be too thick. When I sit down and stand up, the pleats pop out the wrong way and looks a bit odd, but it is easy to pop them back into place. I hope everyone is enjoying their weekend! Top: Cutout Back Raglan Sweater from Forever 21, here. Steal: Cutout Back Raglan Sweater from Forever 21, here. Splurge: MING by Mango Sequin 3/4-Sleeve Sweater from jcpenny, here. Steal: Pleated Circle Skirt from DailyLook, here. Belt: Champion Chainlink Belt thanks to DailyLook, here. Steal: Champion Chainlink Belt from DailyLook, here. Splurge: Avery Hip Belt with Metallic Snake Insert from Linea Pelle, here. Necklace: Autograph Plate and Initial Here Necklace thanks to Taudrey. Love Necklace by Lola James thanks to Socialista, here. Steal: Autograph Plate from Taudrey. C Initial Pendant Necklace, Heart Charm Necklace from Forever 21. Splurge: Name Necklace from Zales, here. Initial Here Necklace thanks to Taudrey. Love Necklace by Lola James thanks to Socialista, here. Bracelets: Rose Gold Pave Beauty Bracelet thanks to Derng, here. Elaina and Suzie bangle thanks to Sequin. Steal: Classic Hammered Chain-Link Bracelet, Geo Cutout Bracelet, and Cutout Stripe Cuff from Forever 21. Splurge: Rose Gold Pave Beauty Bracelet from Derng, here. Elaina and Suzie bangle from Sequin. Ring: Infinity Ring thanks to Silk of Paradise, here. Steal: Infinity Ring from Forever 21, here. Splurge: Infinity Ring from Silk of Paradise, here. Clutch: Katrina Exotic Clutch thanks to Hobo Bags, here. Steal: Fold Over Clutch Purse from DailyLook, here. Splurge: Katrina Exotic Clutch thanks to Hobo Bags, here. Steal: Pointed Toe T-Strap Heels from to DailyLook, here. Splurge: Almond Toe Pumps from Sole Society, here. TGIF everyone! This is my first fitness pairing, I had such a blast taking these photos and I hope you like it! 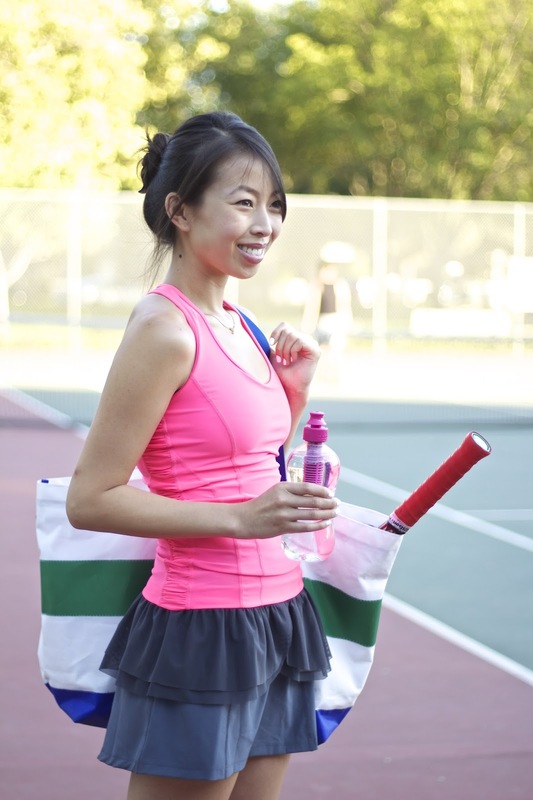 I adore this bright neon pink sport tank, it fits so nicely and is perfect for any sport. 1. Like Albion on Facebook by CLICKING HERE. 2. Like Connnietang on Facebook by CLICKING HERE. 3. Leave a comment on this post with the link to your Albion pin, your name, and email address. This giveaway will run until Friday August 2nd at 12:00 AM PST and is open to US residents who has not won an Albion giveaway in the last 6 months. The winner will be contacted via email, so don't forget to comment with it. Top: Love Racer, Neon Pink thanks to Albion, here. Steal: Love Racer, Neon Pink from Albion, here. Splurge: Track and Train Tank from lululemon athletica, here. Bottom: Advantage Peplum Skirt thanks to Albion, here. Steal: Flounce Skirt from Nike, here. Splurge: Match Point Pleat Skirt from Albion, here. 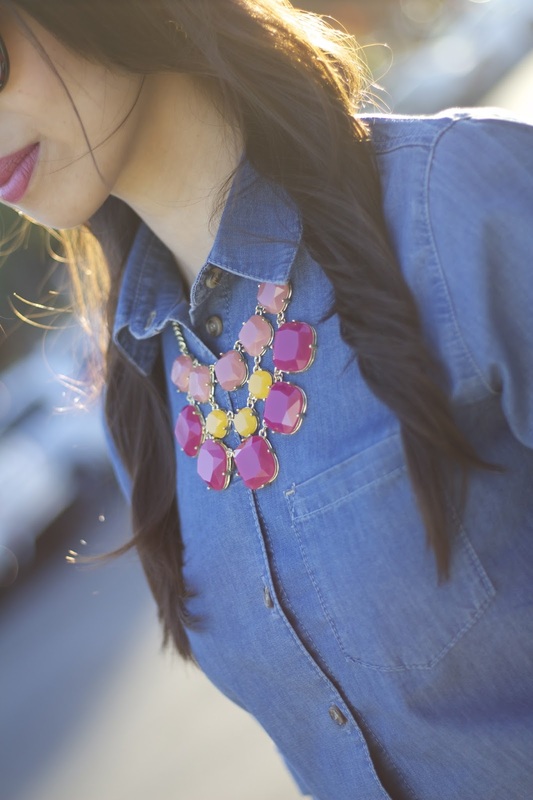 Necklace: Pisces Zodiac Necklace by Rebecca Minkoff thanks to The Trend Boutique, here. Steal: Zodiac Necklace from Taudrey, here. Splurge: Pisces Zodiac Necklace by Rebecca Minkoff from The Trend Boutique, here. Shoes: Adidas Barricade 2 Tennis Shoes. Steal: Adidas adiPower Barricade Shoes from Adidas, here. 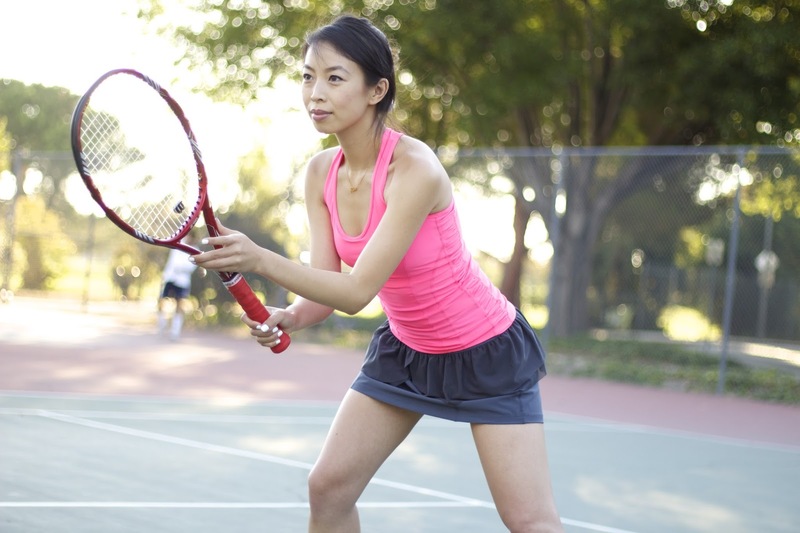 Splurge: Nike 'Zoom Vapor 9 Tour' Tennis Shoes from Nordstrom, here. Splurge: Blue & Green Tote thanks to Hayden Reis, here. 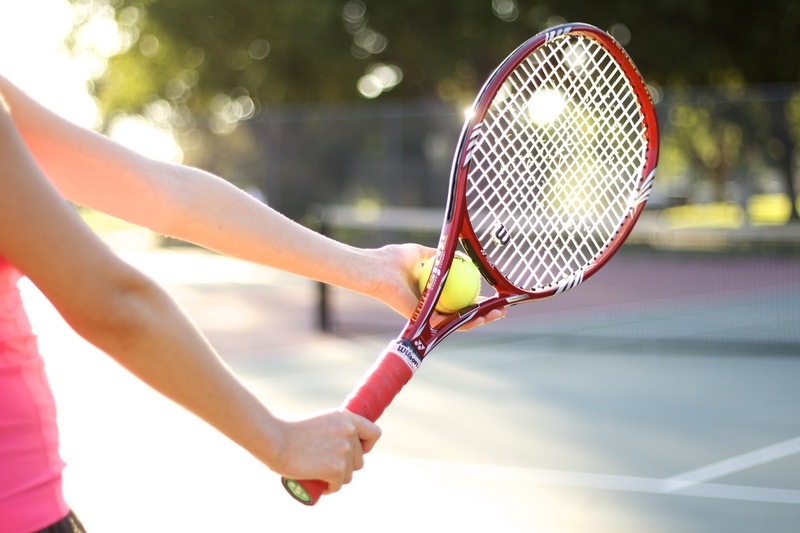 Tennis Racket: Yonex RDis 100. Nail Polish: Porcelin Party Polish by Maybelline, here. Good luck and I hope you have a nice weekend. Hi everyone! I hope you had a nice and eventful weekend. :) I spent it up in SF and did a little shopping at Nordstrom for their Anniversary sale. This pairing was an outfit that I wore on Saturday when we ran errands and attended a friends birthday celebration. I really like this casual chic look because it is very laid back with the loose tee, but chic with my new clear sided heels I got from DailyLook. On the description of the heels it states that these heels run 1/2 small, I totally missed that when I ordered them, but I am happy to report that they fit nicely and frankly, I would say that they run true to size. I wanted to say a big thank you to Taudrey for these stunning personalized necklaces! I truly adore them and love how they layer nicely together. Taudrey is a Miami based jewelry brand and they specialize in handmade personalized items. They recently celebrated their 4 year anniversary (congrats!!) and have so many stunning items. Steal: AE Faded Denim Jacket from American Eagle, here. 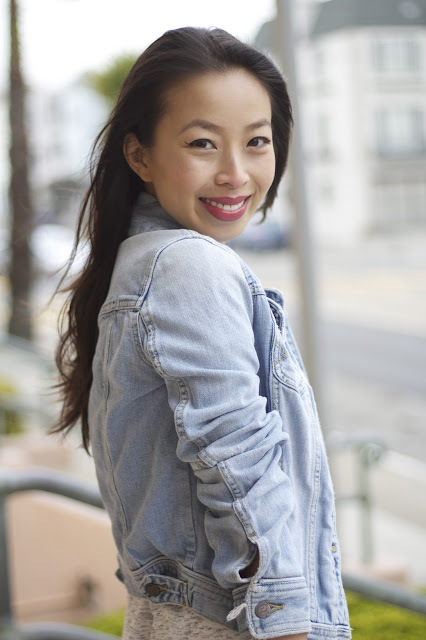 Splurge: Gemma Jacket from Abercrombie & Fitch, here. Shirt: Faux Leather-Trimmed Top from Forever 21, here. Steal: Faux Leather-Trimmed Top from Forever 21, here. Splurge: Shoulder Stripe Top from DailyLook, here. Jeans: Jolt Skinny Jeans from Nordstrom, here. Steal: Life In Progress Jeans from Forever 21, here. Steal: Nadri Initial Pendant Necklace from Nordstrom, here. Steal: Chain Faux Leather Wrap Bracelet from Forever 21, here. Bag: Monochromatic Spectator Purse thanks to DailyLook, here. Steal: Monochromatic Spectator Purse from DailyLook, here. 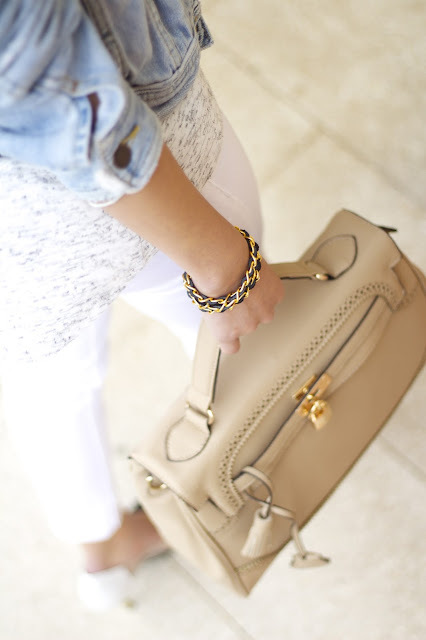 Splurge: Danielle Nicole 'Alexa' Faux Leather Satchel, Medium from Nordstrom, here. Shoes: Chinese Laundry Serendipity Heels thanks to DailyLook, here. Steal: Barely There Party Pumps from DailyLook, here. Nordstrom is having their Anniversary sale right now and I have been doing window shopping online, or browser shopping. :P I've been eyeing this Peplum Trench Coat and this super cute Novelty Sweater (oatmeal color with the cute deer!). Top: Casual Chambray Shirt from Topshop, here. Steal: Denim Shirt from ZARA, here. 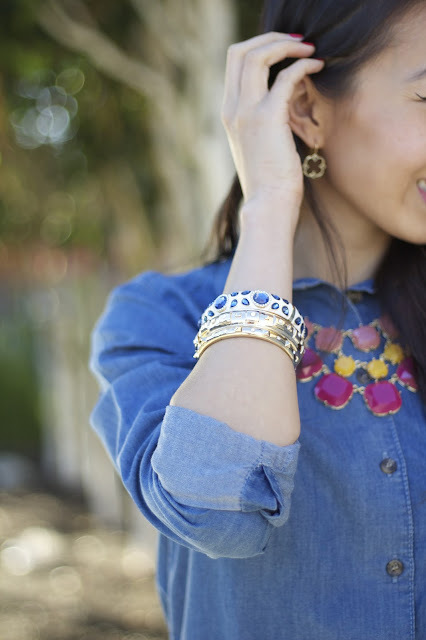 Splurge: Casual Chambray Shirt from Topshop, here. Steal: Summer Party Necklace from Benevolent Jewels, here. Splurge: Descartes Necklace from Mimi Boutique, here. Bracelets: Viola, Elaina, and Suzie bangles thanks to Sequin. Steal: Stud Hinge Cuff, Studded Stretch Bracelet, and Pyramid Sunset Bracelet from Forever 21 and DailyLook. Splurge: Viola, Elaina, and Suzie bangles from Sequin. Earrings: Gold Quatrefoil Dangle Earrings thanks to Punky Bunny Designs, here. Steal: Golden Bloom Drops from Jeweliq, here. Splurge: Gold Quatrefoil Dangle Earrings from Punky Bunny Designs, here. Splurge: Black Leather Chain Bag by JJ Winters from Socialista, here and here. Splurge: Pippi Pump from DV by Dolce Vita, here. I've been saving this dress for a dinner date with the other half and paired it with my trusty leather jacket to keep me warm. We don't live in the same city or see each other daily, so whenever we are together I try to make a point to wear something special. I love prints on clothing and especially adore the colors on this dress. I paired it with mint, turquoise, and gold accessories to keep the look streamlined. Dress: Colorful Floral Dress thanks to L.Mae Boutique, here. FYI: This dress runs a little big, I am normally a small and got a small in this dress, but a xs would have fit better. 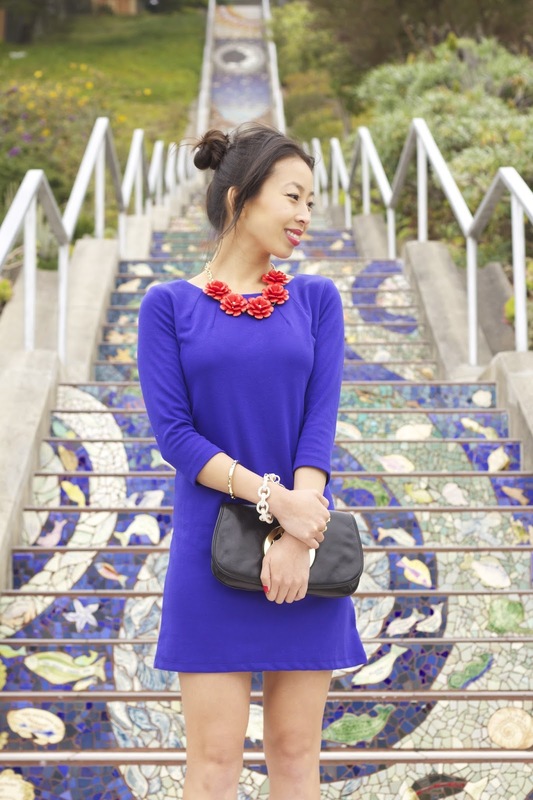 Splurge: Colorful Floral Dress from L.Mae Boutique, here. Steal: Cool Nights Moto Jacket from DailyLook, here. 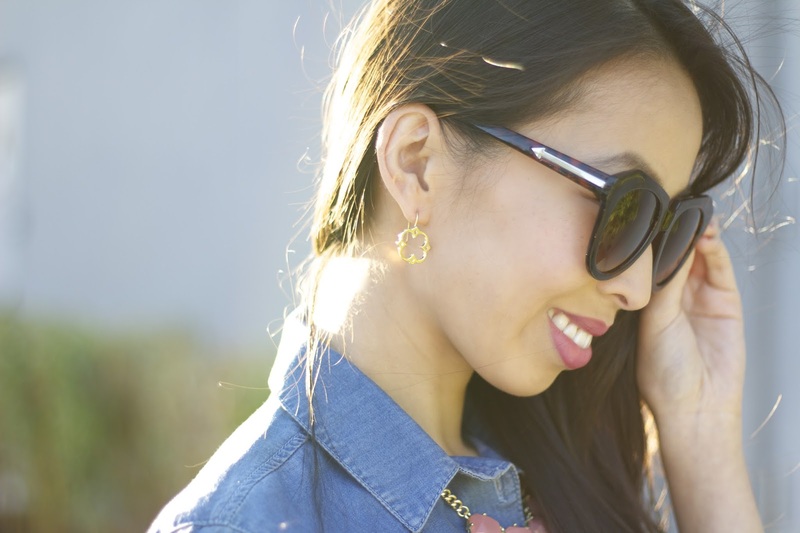 Splurge: Quilted Vegan Leather Jacket from American Eagle, here. Necklace: Necklace 132 thanks to Sira Mara, here. Steal: Necklace 132 from Sira Mara, here. Splurge: Gold & Tan Leather Woven Necklace from CitizenMod, here. Bracelets: Kjersten and Elaina bangles thanks to Sequin, here and here. Steal: Wave Stack Bangles from Jeweliq, here. 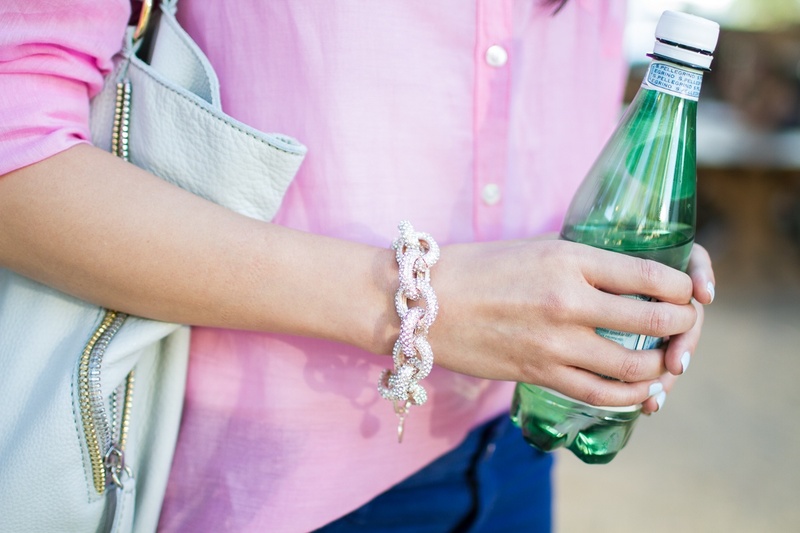 Splurge: Kjersten and Elaina bangles thanks to Sequin, here and here. Bag: Tessa Messenger Bag thanks to Baghaus, here. Steal: Vibrant Chain Strap Purse from DailyLook, here. Splurge: Tessa Messenger Bag thanks to Baghaus, here. Shoes: Vibrant Pointed Toe Pumps thanks to DailyLook, here. Steal: Vibrant Pointed Toe Pumps from DailyLook, here. Splurge: Elsa from Sole Society, here. I had a buffet packed weekend in Las Vegas and it was so delicious! In my opinion, the best buffet is Bacchanal Buffet at the Caesars Palace. We went to dinner and lunch over the weekend, and here is a trick to skipping the loooooonnng lines; you can pay an extra $15 per person and go straight in. For us it was worth it because we wanted to explore around and the wait was over 2 hours! At night, we went clubbing at Marquee and Tryst, I liked Marquee over Tryst and would recommend going to XS instead of Tryst. We only went to Tryst because Lil Jon was the guest celebrity; I thought he was very entertaining and funny. Our last night at Tryst unfortunately got cut short because someone got into my JJ Winters crossbody and stole my phone while we were dancing to Lil Jon. :'( Not cool, I was so upset the rest of the night and phoneless now. Steal: Buttoned Tab-Sleeve Linen-Blend Tunic from Old Navy, here, or Classic Dress Shirt from Forever 21, here. 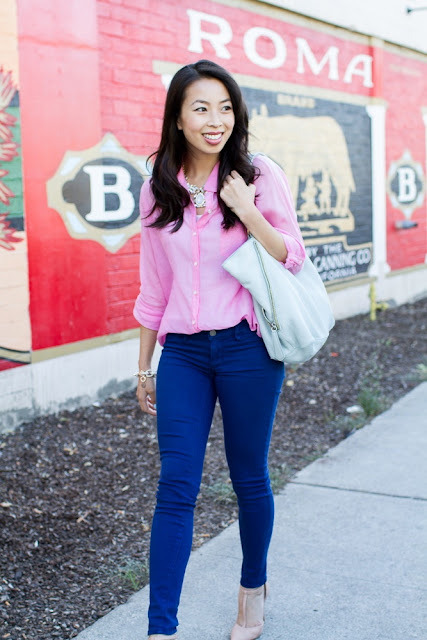 Splurge: Perfect Oxford Shirt from Gap, here. 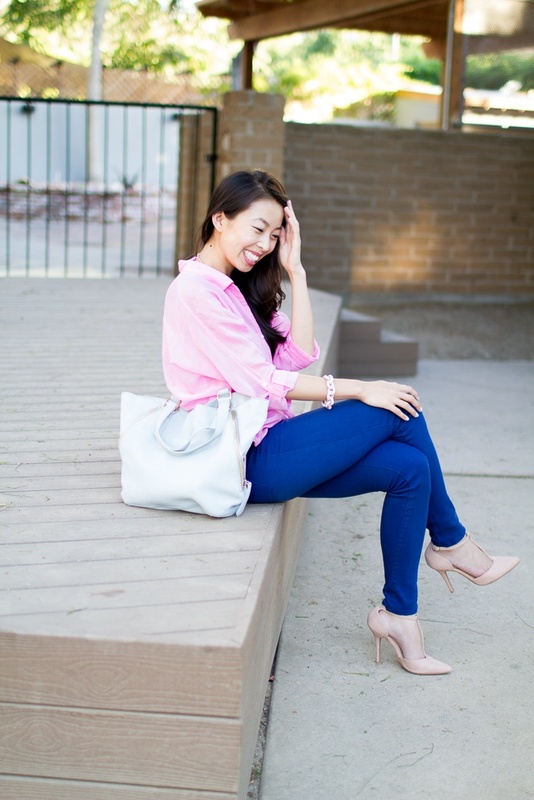 Steal: Zippered Skinny Jeans from Forever 21, here. Splurge: Royal Blue Skinny Jeans from GJG Jeans, here. 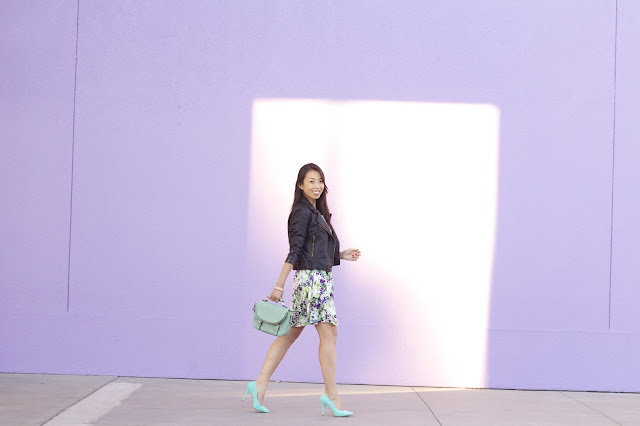 Splurge: Giselle from Sole Society, here. Necklace: Mila Statement Necklace thanks to Love Stylize, here. 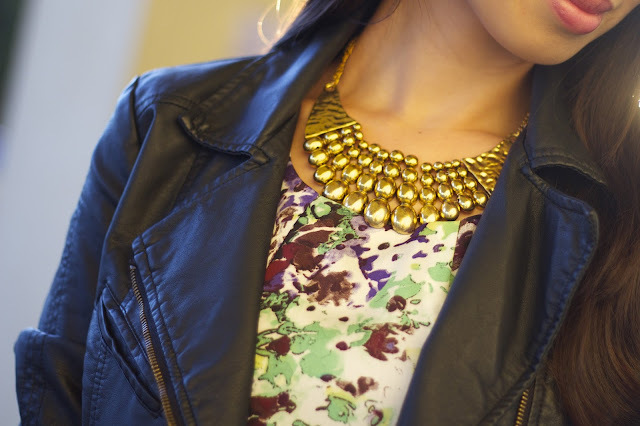 Steal: Mila Statement Necklace from Love Stylize, here. 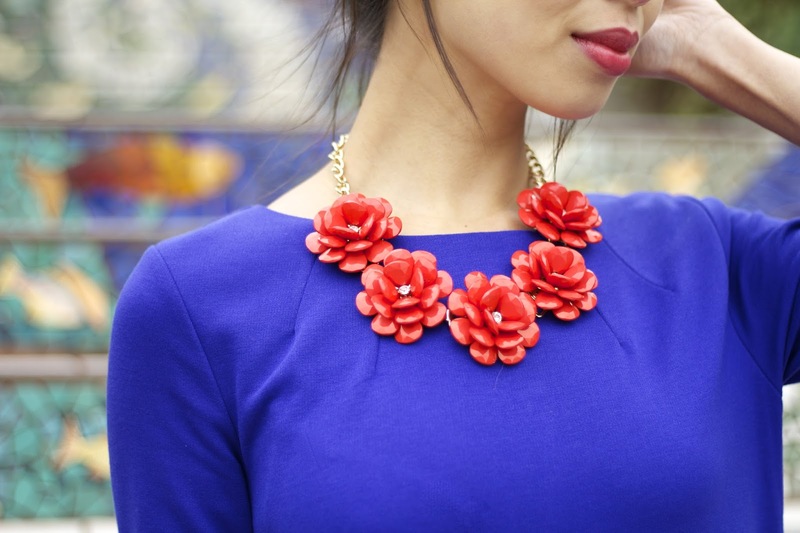 Splurge: Tildon Vintage Floral Statement Necklace from Nordstrom, here. Bracelets: Rose Gold Pave Beauty Bracelet thanks to Derng, here. Steal: Classic Hammered Chain-Link Bracelet from Forever 21, here. Splurge: Rose Gold Pave Beauty Bracelet from Derng, here.